1. Divide the Pimm’s between 4 tall glasses. 2. Scrape the pith from the orange peel and cut into 4mm-wide long strips. Carefully tie each one in a knot. 3. 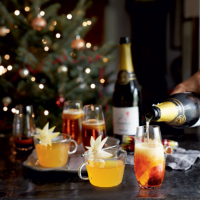 Top up the glasses with sparkling wine and drop an orange knot into each. Serve swiftly. Serve this alongside a Mulled Perry cocktail for a selection of festive drinks to wow party guests.